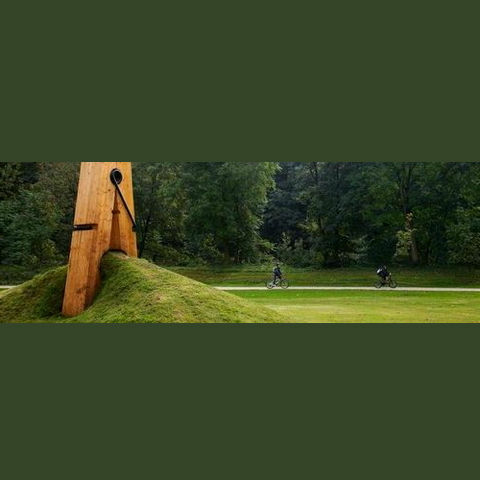 The planet is pinching itself to make sure that it’s not dreaming, with this six-meter sculpture by Turkish artist, Mehmet Ali Uysal. The work was installed as part of Festival Cinq Saisons at Chaudfontaine in the Liege district of Belgium. Yes. Belgium. Whether I want to or not, I will continue to spend a lot of time in Belgium this year. What might seem a rather bland land, however, is saved by its innate sense of surrealism. Giant clothespins, for instance. And Magritte. And Horta. And Hergé. And . . . it’s endless. Back to Uysal, the clothespin pincher. (The sculpture is fully functional as a clothespin, btw.) Uysal participated in this year’s Art Dubai fair, which was on last week. And “on” is the operative word here. This hot fair in a hot land is getting even hotter and more sophisticated. Young collectors (wish we had more of those here), are now a driving force in the Middle East art universe. Watch an interesting newsreel by the BBC about that here. Now . . . how do we here in Indonesia cultivate a more aware and active population of young collectors? Let’s get going on that, kids, right here in Bali. My hunch is that Biasa Artspace, Bali’s go-to gallery for emerging artists, will lead the way. Rumours of innovative outreach and in-gallery programs at Biasa have been heard in certain circles. This must have some connection to a new driving force at Biasa, my dear friend and art dealer, Pierre Nachbaur. Pierre did Art Dubai last week on behalf of Biasa, which was one of only five Indonesian galleries participating. Can’t wait to hear Pierre’s impression of the fair. Biasa’s update about their entrance into the Emirates is here, on their site. One of the five Indonesian galleries at Art Dubai was none other than Ark, a progressive standout in Jakarta’s contemporary art landscape. Interestingly enough, Ark was founded by Ronald Akili and Jason Gunawan, art collectors and irrepressible creative entrepreneurs, who also founded our local hangout, Potato Head Beach Club in Bali. Indonesia definitely made headlines at Art Dubai. (Here’s a great story in Pikiran Rakyat, the top daily paper in Bandung.) With strict censorship codes in the Emirates, a number of works hung for the fair got vetoed immediately by the official halal-vs-haram vettors. One was “Nationalism” a painting by Indonesia’s own Eko Nugroho. Funny story. The censoring committee replaced it with the work of another artist which, unnoticed by them, contains references to Ali, the founder of Shia Islam. Now Dubai, as you know, is almost entirely Sunni. So that picture came down pretty quickly, too. And guess what replaced it? Nugroho’s “Nationalism” went back up on the wall, and stayed there until the end of the fair! The Art Newspaper, which is kind of the New York Daily News of the art world, reports the story here. Their piece is my favourite to date about Art Dubai as a whole. But let’s wait for the monthly magazines’ coverage. Now you know how a giant clothespin in Liege relates to Art Dubai and Bali and other stuff; via a series of Susi Synapses™ (they’re part of a patented process of connective thinking, unique to the Sleeping Tiger on the Island of Bali).